Wordless books often promote more discussion than books with words, which leads to better comprehension. We tend to focus on, and appreciate, the details in the pictures more in these types of books. 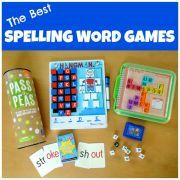 They also encourage the introduction of new vocabulary, help develop storytelling skills and present many opportunities to practice writing. For pre-readers, wordless books give them the opportunity to actually read and understand a book all by themselves. 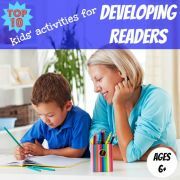 Beginner readers can be encouraged by their ability to 'read' the story fluently, albeit using words of their own choosing. This can be motivating at a time when most of their reading will be frustratingly stilted. They also learn that clues to a story can be found in the pictures, which is a useful reading strategy to help them when reading text. Independent readers can benefit significantly from telling or writing the story unfolding in the pictures. 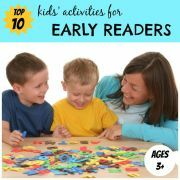 They can be encouraged to add detail about the setting, characters and plot to help develop their storytelling skills. There are many ways of using wordless picture books with your child and each method will help to develop different literacy skills. You can read more about these methods below. 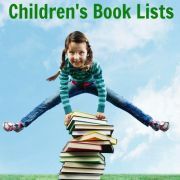 The best wordless picture books to choose for this purpose are those which lend themselves to a narrative structure, with a distinct setting, characters and a plot. You can find examples of some of my favourite wordless picture books here. 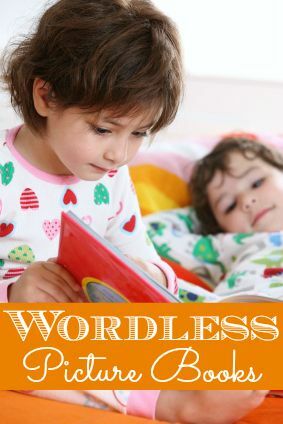 Here are some ideas for how you can use wordless picture books with your child to help develop their reading, writing and comprehension skills. 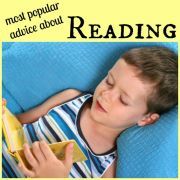 Encourage Discussion When I read a picture book with words to my children we stop to discuss the story at times. They may ask a clarifying question or I might ask them something to check their understanding and develop their comprehension skills. However, often my children just want me to get on and read, and I am also mindful of not interrupting the flow of the story too much. This probably means I don't always follow their lines of enquiry or expand on comprehension points as deeply as I could. With wordless picture books it is different. The beauty of these types of books is that there is much less pressure to read the story in a prescribed way. I can pause and discuss the pictures at length without feeling that I am interrupting the flow of any words. 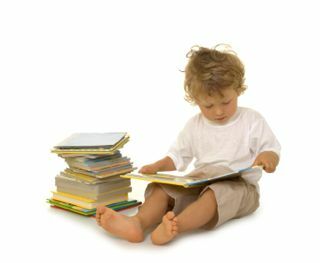 Research at Utah State University confirmed that many mothers are more responsive to their children when they read them wordless books. So take time to talk about the pictures, follow up on your child's observations, build vocabulary, make connections and ask questions. Introduce New Vocabulary One of the obvious ways of using wordless picture books with your child is to tell the story which accompanies the pictures in your own words. Interestingly, the researchers at Utah State University discovered that mothers who read a wordless book used richer language, more complex sentences and longer phrases than mothers who simply retold the printed story. So this is an effective way of introducing new vocabulary to your child. As well as explaining the action in the picture, don't forget to also describe what else you see in the picture, using as many detailed words as possible. Appreciate the Visual Story When I am reading a picture book with words to my children, I tend to focus so much on the words that I barely look at the pictures. I am sure my children see far more detail in the illustrations than I do. However, with wordless picture books I can focus all of my attention on the pictures and help point out things which my children may not spot. How does the picture portray action or emotions? How can picture clues help your child understand more of the story and support their inferences, that is ideas not explicitly stated in the text? Encourage your child to also think about the color choices and mood of the pictures. Why do they think the illustrator used a particular color or technique? Encourage Storytelling Ask your child to tell the story in their own words based on the pictures on each page. Help them to develop their storytelling skills by prompting them to include details about the setting and descriptions of the characters, as well as encouraging them to include the key elements of the plot including the problem which arises and its resolution. Promote creativity and imagination by allowing your child to embellish the story however they want. Suggest that they add dialogue to the storyline. For younger children you could start by narrating the beginning and middle of the wordless picture book and then asking your child to narrate the ending. Or ask them to make up a completely new ending. 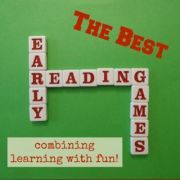 If they are reluctant, give a number of alternative endings and see which one they prefer. Learn About Story Structure and Sequencing Wordless picture books are a great way of teaching your child about basic story structure and the sequencing of events in a story. Once your child has told the story in their own words, ask them to summarise what happened in the beginning, middle and the end. This will start to give them an understanding of basic story structure. Then talk about the different elements of the plot and the sequence of these events in the story. Being able to summarise a story in this way helps to develop comprehension skills. Practice Comprehension Skills As explained earlier, with no words to restrict you, it can be easier to use wordless picture books with your child to practice comprehension skills. Encourage your child to predict what will happen next, make connections between the story and their own lives, discuss what the characters may be thinking and ponder the overall message of the story. If your child is hesitant, start by modelling what you are talking about. Describe what you think will happen next or what certain parts of the story remind you of. Your child should soon get the idea and will hopefully join in. Inspire Writing Wordless picture books can provide the perfect foundation for creative writing activities for younger and older children alike. Your child could write descriptive text to complement each picture, or a selection of pictures. Or they could add dialogue to the characters in the story. Scribe the words of younger children who cannot write yet. Encourage older children to include all the key elements of a story in their text: setting, character descriptions, problem and resolution. Your children could either write their words in a separate home-made book (and perhaps even include their own illustrations) or write on sticky notes which they stick to the appropriate page. Here are some of my favourite wordless picture books which are particularly suited for children aged four and over, although younger children may also enjoy them. You can find specific recommendations for the under fours in the next section. Flotsam by David Wiesner is a 2007 Caldecott Award Winner about a magical camera which washes up on a beach and is found by an excited boy. He quickly develops the film he finds inside the camera and views the amazingly bizarre pictures the film contains. The last photo is of a girl holding a photo of a boy, holding a photo of a girl and so on. The boy photographs himself holding the print and then tosses the camera back into the sea, setting it on its journey towards the next recipient. Tuesday is another incredible wordless picture book by David Wiesner. One mysterious night a squadron of frogs rise on their lily pads and float across the night sky, exploring the nearby houses while their inhabitants sleep. As morning approaches, the frogs return to their pond, leaving their lilypads scattered around the street, to the bewilderment of the police. This 1992 Caldecott Award Winner is a beautiful and humorous book, illustrated with rich watercolors cleverly depicting the moonlit night. Good Dog, Carl by Alexandra Day is a fun book, if you can get over the fact that a mother leaves her baby in the charge of a rottweiler! With endearing illustrations and lots of humour, we follow the baby's adventures during their eventful day, including sliding down the laundry chute and swimming in the fish tank. Carl, the rottweiler, then bathes the infant, cleans up all the mess and waits nonchalantly for the mother to come home. The Lion & the Mouse by Jerry Pinkney was the 2010 Caldecott Award Winner. It is an adaption of an Aesop fable and contains vivid artwork of the African Serengeti with expressively-drawn, but still realistic, animals. A ferocious lion spares the life of an adventurous mouse. The mouse finds a way of returning the favor by freeing him from a poacher's trap. The few words in the book tend to be onomatopoetic. The Snowman by Raymond Briggs is about a little boy who builds a snowman which magically comes to life. The boy shows him his cozy home, which the snowman is fascinated to discover, and then the snowman introduces the boy to his wintry world. A charming story with gentle illustrations, which won the Boston Globe-Horn Book Award in 1979. I much prefer the original version without words. The later version, with words added by Briggs, features fewer pictures and loses some of its charm. The Red Book by Barbara Lehman is a 2005 Caldecott Honor Book about a magical red book which enables a city girl and a faraway island boy to view each other through the pages of the book. A friendship is formed and the girl sets off to find the boy. This would be an ideal stimulus for a creative writing activity. Wave by Suzy Lee is a tender and amusing wordless picture book about a little girl who spends a day at the beach engaging in imaginative play with an ocean wave. As with all games with waves, the girl ends up getting soaked. The beautiful, simple illustrations in this book are all drawn in just two shades of watercolour - grey and vibrant blue. Chalk by Bill Thomson tells the story of three multicultural children who find a bag of chalk in a playground. To their amazement, everything they draw becomes real. Then one of the children draws a dinosaur and they all have to run for cover. Fortunately their creativity enables them to defeat the dinosaur. The beautiful, detailed illustrations look like photographs but have actually been meticulously painted by hand. A Boy, a Dog and a Frog by Mercer Mayer is about a boy and a dog who go for a walk and spot a frog in a pond. Their various attempts at capturing the frog end in failure and so they set off home to clean up. However, the frog realises he is now lonely and so follows the boy and the dog back to their house and into the bathroom, joining them in the bath tub. Mirror by Jeannie Baker has a unique format which allows two stories to be read simultaneously, one from the left to right, following Western conventions, and the other from right to left, following the conventions of Arabic books. The stunning images describe a day in the lives of two boys and their families - one from inner city Sydney, Australia and the other from a small, remote village in Morocco, North Africa. Another interesting wordless book by the same author is entitled Home. The following wordless picture books, or books of just a few words, are most suited to younger children, aged three and under. 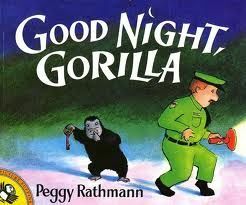 Good Night, Gorilla by Peggy Rathman starts with a zookeeper saying goodnight to a gorilla, but the mischievous gorilla is not ready to go to sleep. He follows the zookeeper around, letting all of the other animals out of their cages, before following the zookeeper to his bedroom and getting into bed. It takes the zookeeper's wife to ensure all (or nearly all) the animals return to their cages. 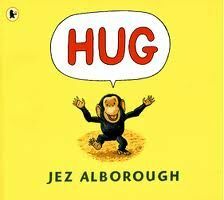 Hug by Jez Alborough tells the touching tale of a baby chimpanzee wanting a hug. As he wanders through the jungle he sees all the other animals, from elephants to snakes, cuddling up with their families. He gets increasingly upset as he realises there are no hugs for him. Eventually he finds his mother and gets the hug he needs. 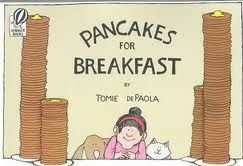 Pancakes for Breakfast by Tomie dePaola is a wordless picture book which follows the trials of a little old lady who attempts to make pancakes for her breakfast. However, there are several obstacles to be overcome before she can achieve her goal. Have You Seen My Duckling? 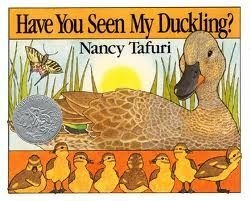 by Nancy Tafuri tells the story of a mother who has lost one of her ducklings (although actually it is cleverly concealed in each picture). She asks all the other pond animals if they have seen it.